"I want you to know my trouble and woe." The classic puppy is a blend of sweetness and mischief. You can expect some good old-fashioned whining thrown in for good measure, too. Puppies employ whining as a means of communicating to the humans in their lives, and it frequently signifies a request of some sort. A whining puppy often is a puppy in need of a trip outdoors. If your puppy is whining, he may be asking you to take him outside so he can eliminate. If you consider the alternative of messy house-soiling, your puppy's whining is actually a polite and considerate action. A human may whine when feeling uncomfortable, and crabby as a result of it, and the matter's not much different in the canine world. Some puppies whine when it's right about mealtime and their tummies are ready for some nourishment. Some puppies may even whine and beg because you gave them a small treat earlier in the day, and they want one yet again. Whining is also a go-to response to temperature issues, whether too hot or too cold. Some young doggies whine when they're feeling worn out and ready for sleepy-time. Like human babies, puppies can get pretty cranky when they're tired. Puppies can be smart creatures, and if they get the idea that whining is an effective means of getting things, they may not hesitate to use it. Many puppies whine out of the sheer desire for attention. If you have in the past given your puppy a favorable reaction to excessive whining, he may directly associate the two things. Avoid giving your puppy a prize for whining, whether through lavishing affection and attention on him or giving him yummy treats. Whining in your poor pup may denote fear. If loud noises occur outside your living room, your doggie may react to the unfamiliarity and jarring sounds by whining as long as the noise keeps up. He might lighten up if he can see what's making the noise. Meanwhile, some puppies -- and adult dogs, for that matter -- deal with intimidating canines of elevated status by whining as a means of expressing instinctive feelings of submission and powerlessness. If your pooch is terrified of a "top dog," his whining may mean something like, "Don't worry about me. I'm not here to fight you, and I'm much weaker than you are. I come in peace." If your puppy has developed an intense attachment to your company, his whining may be a sign of loneliness and separation anxiety. If you start hearing the telltale whimpering every time you approach the door with your bag and keys, it's because he knows the drill -- and knows that your disappearance behind the closing door means that you'll be gone for a while. 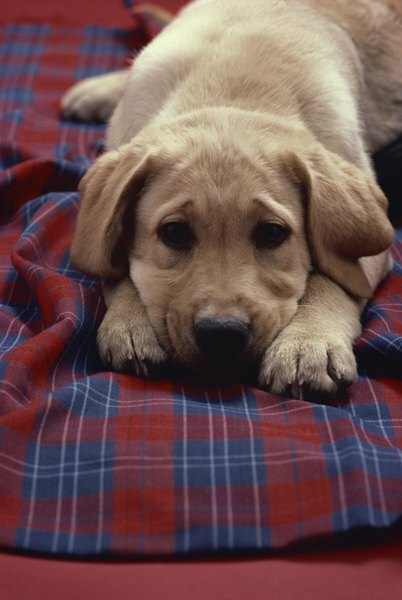 Although whining is common in puppies, don't make assumptions. Whining in dogs often points to bodily injury or sickness. If your puppy keeps whining and you can't figure out exactly what is causing it, an urgent veterinary appointment is of the essence. Internal ailments, skeletal fractures, sprains, headaches and toothaches are some of the circumstances that would make a puppy whine.